We’d love your help. 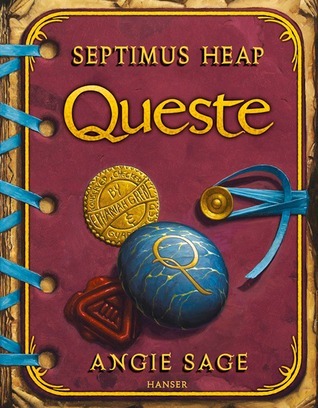 Let us know what’s wrong with this preview of Queste by Angie Sage. To ask other readers questions about Queste, please sign up. What is the setting(time and place)? Septimus Heap is a series of fantasy novels featuring a protagonist of the same name written by English author Angie Sage. In all, it features seven novels, entitled Magyk, Flyte, Physik, Queste, Syren, Darke and Fyre, the first (Magyk) in 2005 and the final (Fyre) in 2013. The quest of the fourth book, Queste (published in April 2008), is a journey to the House of Foryx, in which "all times meet", to bring back Nicko and Snorri, who were trapped there after the events of the third book. Septimus is sent on this mission to Darken his Destiny for Merrin Meredith, who now holds the Two Faced Ring by a ghost called Tertius Fume. Assisted by Jenna and his friend Beetle, among others, he pieces together a map to the House of Foryx. When they reach the house, Septimus meets Hotep-Ra, the first ExtraOrdinary Wizard, while Jenna and Beetle find Nicko and Snorri. Marcia and Sarah Heap arrive outside the house on Spit Fyre, and they return together to their own time. This is definitely not going to get darker. The tone of the book remains true to its predecessors; light, amusing and juvenile and I think I’ve gotten used to it. It’s funny how in every book, one of the Heaps goes missing and the rest embark on a perilous journey to find him/her. There is a lot going on at first, multiple things are introduced at once, but then they all fall together with ease and things go in a single direction. I have to say, the love the Heap siblings share is absolutely end This is definitely not going to get darker. The tone of the book remains true to its predecessors; light, amusing and juvenile and I think I’ve gotten used to it. It’s funny how in every book, one of the Heaps goes missing and the rest embark on a perilous journey to find him/her. There is a lot going on at first, multiple things are introduced at once, but then they all fall together with ease and things go in a single direction. I have to say, the love the Heap siblings share is absolutely endearing. Jenna, Septimus and Nicko are so frickin’ adorable and they care so much for each other. Particularly how all the older brothers care for their little sister and brother, it just makes me ‘aww’ and wish that I too had heaps and heaps of older brothers. This was, as usual, a fun book. It added yet more to the world of Septimus Heap and made some exciting revelations. Loved it the second time I read it! 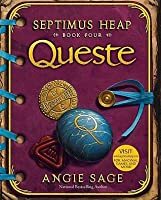 The fourth tale of Septimus Heap delivers action, adventure, magic, and a good share of surprises. The tale begins when Nicko Heap and Snorri, who in a previous book found themselves transported out of their own Time, discover a clue that might allow them to return to their home Time. However, the path home is a tricky one: Nicko and Snorri must find their way to the mysterious House of Foryx, "the place where all Times do meet." Once they are there, the difficulties are not over. Finding and entering the House of Foryx is hard enough, but once they are in, they must wait for someone from their own Time to enter before they will be able to leave and return home. Meanwhile, the notes regarding Nicko and Snorri's preparations for this journey have survived until Septimus's time, under the care of the long-lived alchemist Marcellus Pye. Using the notes and lists that Nick has left behind, Septimus and Jenna are able to figure out what it is that Nicko and Snorri are attempting, and set off to reach the House of Foryx themselves, so that their appearance might allow Nicko and Snorri to return to the correct Time. However, their plans are complicated by the pernicious ghost of Tertius Fume, who contrives to send Septimus against his will on a Queste from which no apprentice wizard has ever returned. While the plot rambled in places, I enjoyed the overall arc of the story, and in the end I was glad for the slow development at the beginning which built up to the climax. Sage's characterization was impressive; I got a good idea of the relationships that had formed between characters in previous books, as well as a sense of their internal states and motivations. Her large cast of secondary characters was deftly managed as well. As a newcomer to the series, getting my bearings was slightly confusing, but after a while I began to understand the backstory better, thanks to the author's hints and insinuations at what had happened before this book. There were still moments when I felt like I was missing out on something--moments where I was sure that the emotional impact would have been greater had I read the previous three books in the series--but overall I was still able to enjoy it, and would recommend it thoroughly. DISCLAIMER: Would have read this book sooner, but a friend of mine paid for my Warped Tour ticket at the last minute and I HAD to go. Such an improvement over the last book, Physik, where it felt eerily too similar to Prisoner of Azkaban, when it came to the time travel element. Plus, It was boring. This installment is what the title says, a Quest(e) to undo the events of what happened at the end of the last book. Also, it's a quest until the very end; there's no true bad guy that Septimus and Jen DISCLAIMER: Would have read this book sooner, but a friend of mine paid for my Warped Tour ticket at the last minute and I HAD to go. This installment is what the title says, a Quest(e) to undo the events of what happened at the end of the last book. Also, it's a quest until the very end; there's no true bad guy that Septimus and Jenna and the group face off with at the end, but with the introduction of the character Tertius Fume, another ghostly ExtraOrdinary Wizard of the distant past involved in the Darke arts, it did add a darker tone, for a middle chunk of the story. Plus, there is growth to the characters. You see Septimus try out new Magyk in dire times and even Beetle, who is generally the timid best friend but excels in, basically a library *raises hand*, shows some some stronger development. This is my most favorite out of all the books in the series that I've read so far. I love Spit Fyre's humour, it made the book more enjoyable [Merrin's idiocy too, LOL!]. QUESTE takes Septimus, Jenna and Beetle in search of Nicko and Snorri, to bring them back from the past. They go to Marcellus Pye, who has remembered some information from his 500 year old memory and provides them with some notes from Nicko and Snorri. The notes say that they planned to travel to the House Of Foryx where all times meet, and there they expected to come back to their time. Jenna takes the notes back with her to the Palace. In the meantime, Merrin Meredith travels to the Castle in h QUESTE takes Septimus, Jenna and Beetle in search of Nicko and Snorri, to bring them back from the past. They go to Marcellus Pye, who has remembered some information from his 500 year old memory and provides them with some notes from Nicko and Snorri. The notes say that they planned to travel to the House Of Foryx where all times meet, and there they expected to come back to their time. Jenna takes the notes back with her to the Palace. In the meantime, Merrin Meredith travels to the Castle in hope of destroying Septimus. He bumps into Jenna who drops all the notes of Nicko and Snorri, they get wet. Jenna goes to the The Manuscriptorium and asks Beetle to help her replace the notes. Beetle then takes her to the restoration specialist Ephaniah Grebe. Ephaniah is a half man-half rat being. He Restores the pages and binds them in to a book, but they still miss one piece, the center of the map to the House of Foryx. Merrin, in the meantime, takes the job of a scribe in the Manuscriptorium. There he meets the ghost of Tertius Fume, the first Chief Hermetic Scribe. Tertius makes him transfer the loyalty of the Thing to him and assures that he will send Septimus on a perilous Queste. Tertius Fume arrives at the Wizard Tower along with the ghosts of all the previous ExtraOrdinary Wizards and announces that they are about to draw the Queste stone. Septimus feels a Darkenesse inside the urn where the stone is kept and tells that a Thing is there to sabotage the draw. They escape the Wizard tower as Tertius Fume puts it under Siege. But accidentally Septimus takes the Queste stone from Hildegard thinking it to be a safe charm despite what Marcia says about taking charms from strangers. I found I got through this Septimus Heap book much quicker than the others. It still took a while to get going but the end of the previous book (Physik) felt like much more of a cliff hanger than the previous books in the series so Queste felt like more of a sequel than just another book with the same characters. I wanted to find out what had happened after the last book so I was eager to get going. I was pretty impressed to, I’ve liked the other Septimus Heap books but the series seems to be ge I found I got through this Septimus Heap book much quicker than the others. It still took a while to get going but the end of the previous book (Physik) felt like much more of a cliff hanger than the previous books in the series so Queste felt like more of a sequel than just another book with the same characters. I wanted to find out what had happened after the last book so I was eager to get going. I was pretty impressed to, I’ve liked the other Septimus Heap books but the series seems to be getting better the further I get into it and I found a big difference with this book. I think this book was a bit more individual, a lot of the time I find the Septimus Heap books could just be any other book about wizards, you know it has everything you would expect from a wizarding novel but nothing that really sets it apart. I found with this novel that it was more like Sage had created another world, the forest and all its contents felt rather original, although there were still sections that were the type of things that are pretty standard to fantasy novels (not that that’s a problem, it’s just nice to have something different). There was one thing I didn’t like in this book though and that was the sections with Merrin. I can’t say I ever really liked Merrin but I had some sympathy for him and that was pretty much destroyed by this book, and it was more or less uneccersary. I think Sage could have filled his role easily some other way seeing as he was basically there to secure one small plot point. I thought using him to secure that point was actually a little unrealistic and I could think of a few other ways in which it could be introduced without using Merrin. Well, After a rather disappointing continuation in the previous book (my personal opinion, so no heart feeling) I was surprised to read the next book Queste which was as good as the First book in the series. The story continues with Septimus treating the people from Sicknesse, and later had himself preoccupied with his assignment as an Apprentice. ON the other end, the fake Septimus Heap with the real name of Merrin Meredith has a plan on his own. (I hate this boy!!!) Anyway, he made a deal with Well, After a rather disappointing continuation in the previous book (my personal opinion, so no heart feeling) I was surprised to read the next book Queste which was as good as the First book in the series. The story continues with Septimus treating the people from Sicknesse, and later had himself preoccupied with his assignment as an Apprentice. ON the other end, the fake Septimus Heap with the real name of Merrin Meredith has a plan on his own. (I hate this boy!!!) Anyway, he made a deal with an evil ghost name Tertius Fume (A betrayer! !A cheater!! !) Using his scrupulous method he tricked the EAW to make her apprentice to do a QUeste. Anyway, the journey continue with Septimus, Jenna and Beetles embarking on a Journey ( I`m not fond with the way Septimus hiding things from Jenna) to find their missing brother NIcko. I find that the end of the castle siege was quite funny because DomDAniel is forever gone when his bone was being eaten by Spit Fyre for breakfast! A nice reading indeed! !NUff said! Such a cute book. This series gets better with each story. I'm loving them! Fourth in the Septimus Heap fantasy series for middle-grade readers and revolving around the Heap family. The focus is on Beetle. It takes almost 200 pages before we start to get to the purpose of the story, and thoughout, it's an odd combination of Roald Dahl, Harry Potter, and Disney with that fun sense of gross that Dahl brings to a story — I mean, a banana-bacon chew?? ewww — the supportive camaraderie of Harry Potter and his friends, and the cartoon craziness of Disney. 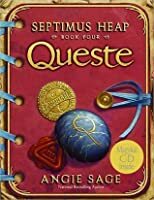 This is a story Fourth in the Septimus Heap fantasy series for middle-grade readers and revolving around the Heap family. The focus is on Beetle. This is a story that you should read as soon as you can after the first three. That four years since I last read a Septimus Heap has left me very confused as to who, what, how, or why. A nice lesson in here from Simon: he no longer wants to become a wizard the easy way, through the Darke. He wants Lucy to be proud of him. It's a silly story with lots of action, drama, and laughs. Children will adore it, and adults may well get a laugh as memories of fanciful childhood dreams surface. It's Jillie's fault. Putting that ad up. Just anyone can apply and Jillie will take him! And that anyone just happens to be Merrin, er, Daniel Hunter. It's that bargain Merrin makes with Old Tertius who will send Septimus on a Queste from which he will never return. But he won't go alone, for Beetle, Princess Jenna, and Ullr will go on Queste with him. If they can escape the Witch Mother. And the Thing. Beetle Beetle, a.k.a., Cockroach, is the Front Office and Inspection Clerk at the Magykal Manuscriptorium and Spell Checkers Incorporated where he inspects the Seals in the ice tunnels. His mother, Pamela Beetle-Gurney, lost her husband, Brian, shortly after young Beetle's birth. Jillie Djinn is the Chief Hermetic Scribe and Beetle's boss. Foxy is one of the more highly strung scribes. Partridge is another of the scribes. Ephaniah Grebe is the half-rat, half-human Conservation, Preservation, and Protection Scribe who lives and works in the basement. Marcellus Pye is the 500-year-old Last Alchemist with whom Snorri and Nicko have been staying. He's also the one who kidnapped Septimus through the Glass and for whom Septimus was Pye's Alchemie Apprentice. …a scattered family with some living in the Castle and others in the forest. In the Castle is Sarah Willow Heap, Sep's mother who was trained as a healer and gave up Magyk; Silas, her wizard husband; Maxie, their wolfhound; and, Jenna, their daughter (well, Milo is her real father) and the Princess and heir to the Castle. Jenna's pets include Ethel, the crocheted-waistcoat-wearing duck. Ullr is a Transforming cat Jenna is watching. DayUllr is a regular mottled orange house cat; NightUllr is a panther. Silas' father, Benjamin Heap, was a Shape-Shifting wizard who now lives as a western red cedar somewhere in the Forest. Demelza Heap is an ancestress who used to sell fine glass apparatus until she disappeared. …that lying young Septimus is stuck with Marcia Fusspot Overstrand, the ExtraOrdinary Wizard. Boris Catchpole is a night porter (demoted from failed wizard); he had been a Deputy Hunter back in the Young Army. Spit Fyre is Septimus' dragon. He's a challenge to keep fed and be a good little dragon. The four sons living in the forest with a coven of witches include Sam, Edd, Erik, and Jo-Jo. There aren't many servants in the castle, only Cook, Cleaner, the WashingUp Boy, and the Housekeeper. The Castle is, however, stuffed with ghosts, including Sir Hereward, a ghost guard. The unhappy Billy Pot is in charge of mowing the lawn and collecting Spit Fyre's dung. He's about to become the Dragon-Watcher. Hildegarde Pigeon is a sub-Wizard on door duty at the Palace. Stanley is an ex-Message Rat and an ex-Secret Service Rat who still has his instincts. He's thinking of starting the Message Rat Service back up. Dawnie is not his wife any longer. Humphrey was his old Message Rat Service boss who retired six months ago. When the RatStranglers had formed up. Mrs. Gringe is the wife of the gatekeeper and Lucy's mother. Micky Mullin is the ferryman and one of Sally Mullin's many nephews; she runs the Sally Mullin's Tea and Ale House. Jannit Maarten is a boatbuilder to whom young Nicko is apprenticed. Rupert Gringe is nearing the end of his Articles. The Grateful Turbot Tavern offers up beds and haunts. Olaf Snorrelssen is the ghost of a Northern Trader, and he chooses to make his first Appearance to Merrin. A mistake. Terry Tarsal is a shoemaker with a purple python. Ma Custard runs the All-Day-All-Night Sweet Shop where Merrin gets his licorice snakes, toffee termites, spider floss, and more. …ghosts of all previous ExtraOrdinary Wizards. They come together when the Apprentice draws a stone from the Questing Pot. Maurice McMohan has advice for Septimus. Julius Pike is another who lost Apprentices. Syrah Syara and Talmar Ray Bell were Apprentices lost on Queste. Marcus Overland was an Ordinary Wizard. The Ghost of the Vaults is one of the Ancients, ghosts over 500 years old. He's very unpleasant and refuses to tell anyone his name. Beetle has figured out that he's the very first Chief Scribe: Tertius Fume. Eldred and Alfred Stone are the brothers and tunnel ghosts trapped in the Emergency Freeze. Moaning Hilda is an Ice Wraith. The Toll-Man is a greedy, nasty bugger of a thief. Morwenna is the Witch Mother. Marissa (she's hooked up with Jo-Jo) and Bryony are some of her witches. The Old Quarry is a cave where the witches spend the winter. Madam Agaric was Morwenna's predecessor. …the Place Where All Times Do Meet is also a Place of Waiting. You can only leave when someone arrives, and then you have to enter into their time. It's the DoorKeeper's fault that they all fall in. The Guardian of the House is a nasty, vicious woman. Brat and Fowler are two of the Guards. Nicko Heap has been gone for six months with Snorri Snorrelssen, who had a grandmother, Herdis Laursdottir, who lost a sister, Ells. Alfrún is Snorri's mother. Snorri also has a sister named Herdis. Old Mother, a.k.a., Ells Laursdottir, is a stallholder who happens to be from the same time as Nicko and Snorri. Hotep-Ra was the Castle's very first ExtraOrdinary Wizard, and he set up the honor of the Queste. The Akhu Amulet is the symbol and source of the power of the ExtraOrdinary Wizards. Alther Mella was the last ExtraOrdinary Wizard. Alice (she had been the Chief Customs Officer at the Port) was the one he had loved, but their careers had been too important. Now that she's dead, Alther intends to change that. …Simon Heap is the son who went bad and ran off with Lucy Gringe. Thunder is Simon's horse. Merrin Meredith, a.k.a., Daniel Hunter and Septimus Heap, is Simon's sulky assistant. His previous master had been the almost indestructible DomDaniel who had constantly called him stupid. A Glass is a portal to another time from which it is near impossible to return. Things are a kind of human figure that most people can't see. A good thing as they're mean, miserable, and nasty. The oxblood cover with its gilt border and gilt trim in the corners is fun with its punched out holes along the left edge and the turquoise ribbon "binding" the book together with more turquoise ribbon wrapping around a gold button to keep the book closed. The outer edge of the cover is aged, curling parchment, furthering the impression of an old ribbon-bound book. The series information, title, and author are also in a gold foil. The pebble of lapis lazuli is the Questing Stone. The title is the journey, the Queste, upon which the quartet sets out, desperate to find Nicko and Snorri, sort of. All of those before can be read without needing the one before but here a vital part of the book influencing this making it a duology with book 3. Still good, likable characters and some not so, nice illustrated and still the same expanding good and clever world. 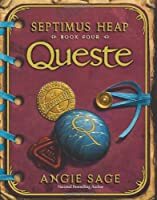 Angie Sage grew Angie Sage (born 1952) is the author of the Septimus Heap series which includes Magyk, Flyte, Physik, Queste, Syren, Darke and Fyre. She also wrote the Todhunter Moon series, and the Magykal Papers, an additional book with extra information about Septimus' world. She is also the illustrator and/or writer of many children's books, and is the new writer of the Araminta Spookie series.